We maintain ADD on Mapletree Commercial Trust with a higher Target Price as we raise our terminal growth assumption to 3%, in line with its 4-year historical DPU growth. Vivocity and MBC I, which are positioned as a destination mall and grade A business park, respectively, should continue to drive the trust’s earnings. A major rerating catalyst is the acquisition of MBC II. To recap, MAPLETREE COMMERCIAL TRUST (SGX:N2IU) delivered an encouraging set of results in 9MFY18 with revenue and NPI increasing by 2% and 2.2%, respectively, driven by its two largest assets, Vivocity and MBC I, which together contributed about 77% of its 9MFY18 NPI. As at Dec 2018, Vivocity was fully occupied at 99.9% with a good rental reversion of +4%. Its office segment reported occupancy rates of between 96% and 100% and strong rental reversion of +8.7%. MBC I’s occupancy continued to improve from 93.3% in 2017 to 97.5% in 2018. Although we do not expect Vivocity to deliver double-digit rental reversion like it did in the past few years due to the lack of major AEI and as the mall matures, it is one of the few destination malls in Singapore and is connected to Sentosa Island, which will be developed as part of the “Southern Gateway of Asia” through 2030. We expect this mall to continue to enjoy steady traffic growth from both tourists and the locals, which will attract tenants and in turn provide consistent positive rental reversion. Vivocity’s committed occupancy rate remains high at 99.9%. The opening of a 32k sf library at level 3 recently should help to drive more traffic into the mall. As for MBC I, we see consistent demand due to its proximity to the CBD area, grade-A office building specifications and lower average rental rate as compared to CBD offices. Historical low development of business park supply island-wide should continue to support rent reversion, especially for buildings in more strategic locations and with grade-A office specifications, like MBC I. The property has minimal lease expiry in FY19 (2.4% of gross rent) and FY20 (9.1% of gross rent). The high lease expiry of 40% in FY21 is something to watch out for. We maintain ADD on Mapletree Commercial Trust with a higher DDM-based Target Price of S$1.90 as we raise our terminal growth rate to 3%, in line with its DPU growth in the past 4 years. 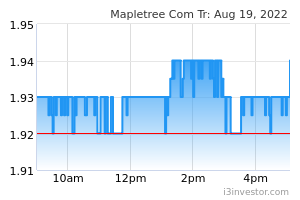 At S$1.90, Mapletree Commercial Trust will be yielding 4.9%, similar to the large caps in the retail and office subsectors. A major re-rating catalyst is the acquisition of MBC II. We estimate that the acquisition of MBC II could be 4-5% DPU accretive, assuming a 60:40 debt-to-equity funding. Downside risks include worse-than-expected retail and office rental reversions.